WBP Result of Jail Police Warder Recruitment 2015; West Bengal Police Recruitment Board (WBPRB) just completed the PET/PST for Warder Recruitment in West Bengal Correctional Home Services. 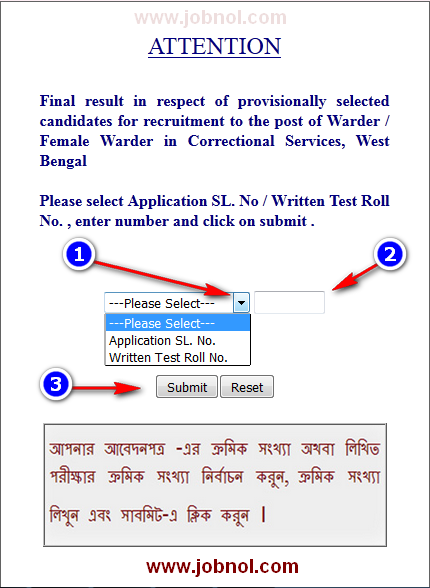 The Result of Jail Police Warder Recruitment in West Bengal Correctional Services is now available. Final Result of Recruitment to the post of Warder / Female Warder in Correctional Services, West Bengal. List of Provisional selected candidates for recruitment to the post of Warder / Female Warder in Correctional Services, West Bengal has been published and uploaded on the websites of West Bengal Police (policewb.gov.in) and Correctional Services, West Bengal (wbcorrectionalservices.gov.in). The candidates may search the result in the website either putting their Application Sl. No. or Written Test Roll No. Select "Application SL. No." or "Written Test Roll No"
0 Comment to " WBP Final Result of Jail Police Warder Male Female Recruitment 2015 - www.policewb.gov.in "